Preparing to shield your home from the harsh winters and intense high-altitude sunlight that Erie, Colorado, can experience is as easy as calling Scottish Home Improvements. We are your local Erie siding replacement experts, eager to show potential customers like you a variety of exterior options and to help you determine which products are the most cost effective, practical, and valuable for your personal housing needs. Our team will also explain to you how different types of siding materials can aid you in lowering your utility bills and maintenance costs, helping you to save money in the long run. Below, we’ve outlined just a few of the many siding products, siding replacement services, and siding repair services that Scottish Home Improvements has to offer. Many local residents in the area are enjoying the durability that fiber cement James Hardie® siding provides Erie homes. This particular type of James Hardie siding will last years longer than other products. It reduces the effect of problematic conditions that commonly afflict other types of siding, such as rotting, curling, warping or splitting from extended exposure to moisture. Fiber cement James Hardie siding is Engineered for Climate® to resist the harshest Colorado weather conditions, including the UV rays, wind, rain, pests, and heat that affect us at higher altitudes. This type of fiber cement siding also benefits from James Hardie’s exclusive ColorPlus® Technology, which utilizes a proprietary process to apply multiple layers and consistent coats of paint inside of a climate controlled factory to eliminate debris, optimize paint adhesion, and reveal a consistent finish that requires little maintenance. It is also fire retardant, as well as hail and woodpecker resistant. We provide a HardieWrap® and rigid foam insulation for each of our clients who opt for fiber cement James Hardie® siding on their Erie home, as a way to help reduce the cost of their energy bills. Additionally, fiber cement James Hardie siding enhances Erie homes through a variety of styles and colors, allowing Scottish Home Improvements to design an exterior that is beautiful. We have the flexibility to match any current exterior elements which you wish to keep in place, such as natural stones, wood, or brick. Your newly revamped home exterior will increase the value of your home and ensure aesthetic longevity for years to come. And you have James Hardie’s excellent warranty to count on for added peace of mind! Beyond fiber cement siding, Scottish Home Improvements has a range of siding options for Erie residents to add onto their residential or commercial property. You can read more information about these alternate siding options below. Another James Hardie® product that Scottish Home Improvements offers VerticalPanel® stucco textured siding. Options for Erie homes like this elegant style are a popular choice for Erie, Colorado residents. Unlike traditional stucco, these panels are stronger and more durable. Stucco siding options help Erie properties resist cracking and chipping to provide you with long lasting and beautiful results for your home. Once installed this lovely siding option requires little maintenance. Scottish Home Improvements can provide multiple steel siding options for your Erie home or business. Steel siding is often used in both commercial residential areas due to its unique industrial look. And it is certainly durable and needs little maintenance to upkeep its fantastic quality. For these reasons, as well as its affordability, steel siding is an excellent choice for your space. Scottish Home Improvements carries a wide range of vinyl siding options for Erie property owners. 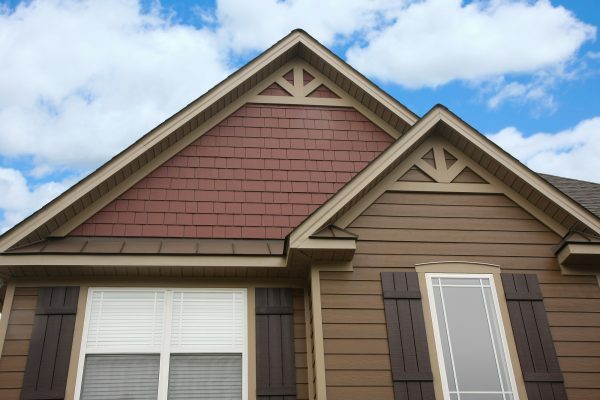 Vinyl siding is a great option for residing a property on a limited budget and comes in a variety of colors and styles. Due to its natural look and rich color, wood siding is a classic choice for Colorado homes. Wood siding invokes the beauty of mountain landscapes and forests and makes a stunning addition to homes in the Erie area. Stone siding is a very popular choice for high end properties and luxury homes in Erie. Stone siding can be used on its own or in combination with lap siding or stucco siding for a particularly stylish look. Our experts will help you in placing stone accents in the right areas so that it compliments your home’s unique features. For those times when your budget calls for repairing rather than replacing the siding on your home or business, Scottish Home Improvements’ siding repair services in Erie are a spectacular and affordable option. We can match the current materials aesthetic of your commercial or residential property using cutting-edge techniques, blending your siding repair seamlessly into your property. Scottish Home Improvements has been locally and loyally serving the residents of Colorado for the past 10 years, establishing our reputation as the number one siding contractor in the state. Discover how our attention to detail, our excellent customer service, our knowledgeable staff, and our high-quality products mean more stunning and impressive results for your Erie home when you call us to receive a free estimate for your exterior siding repair or replacement needs.